The amazing staff in our Wildlife Enquiries team have received a fair few calls recently about a proliferation of ladybirds. And our callers certainly aren't wrong; there have been a lot more than usual around - on social media and in the flesh - this autumn. The hashtag #ladybirds has entered Twitter's lexicon and pictures of Seven-spotted (below) and Harlequin varieties have even, erm, taken off on the site too. But are there really more this year? Or is it just a red-and-black herring? Helen Roy, who co-runs the UK Ladybird Survey and is also an ecologist at the Centre for Ecology and Hydrology, told BBC News: '"The Harlequin ladybird numbers are quite high this year. "They built up in large numbers over summer, so we expected to see high numbers reported as they entered people's houses to spend the cold winter months." Helen has been encouraging people to record ladybird sightings and numbers for more than a decade. The survey is accessible via a website, Twitter (@UKLadybirds) and a smartphone app, and has recorded around 100,000 sightings from some 20,000 contributors so far, with Helen using the statistics it provides to inform her research. 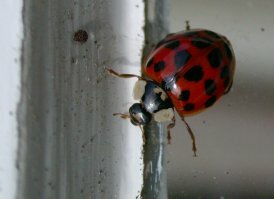 "This time of year all ladybirds go into a dormant state and Harlequin ladybirds choose to go into buildings as their winter habitat," added Helen. "They particularly like pale buildings. Native species, such as the Seven-spot ladybird, tend to bed down in leaf litter, some species over winter in the stems of plants or behind bark. "Harlequin ladybird (below) numbers are quite high this year. They built up in large numbers over summer, so we expected to see high numbers reported as they entered people's houses to spend the cold winter months." 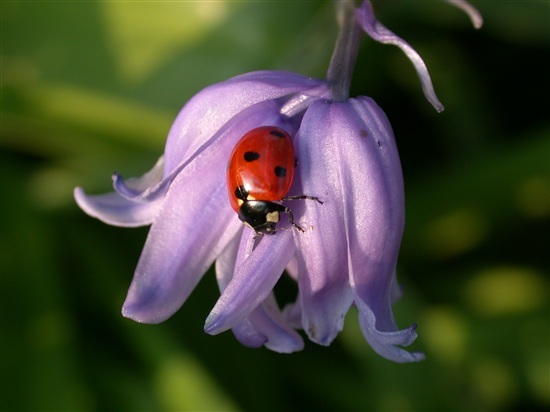 RSPB Supporter Adviser (WIldlife) Ben Andrew added that ladybugs can be more visible in late autumn, particularly November, as temperatures drop, natural food sources are scarce and they look for somewhere to hibernate. "That can be a crack in a stone wall or a crevice in a tree but, occasionally, they will also try to enter buildings such as our homes," said Ben. "Sometimes large groups of them gather to do this and people can be 'inundated' with them. But our homes are not suitable places to hibernate as the temperature can fluctuate with central heating." Ben advises callers who find ladybirds inside their house in winter to move them outside. "If a ladybird wakes up inside a house in the middle of winter and cannot find any food it will die, so we encourage people to gently remove them and place them back outside, ideally near or in somewhere natural that they can use for hibernation. "A garage, outbuilding or shed is OK as the temperature is akin to the outside world and doesn’t fluctuate." Going back in time, the hot summer of 1976 is remembered as a particularly good year for ladybirds, with swarms of the winged insects, collectively and charmingly known as a loveliness, infesting towns and cities across the UK. Although 2016 didn't match 1976, the warmer than average spring and relatively dry summer has been a factor in greater than average numbers. Whatever the cause, it's important to recognise that ladybirds aren't pests. 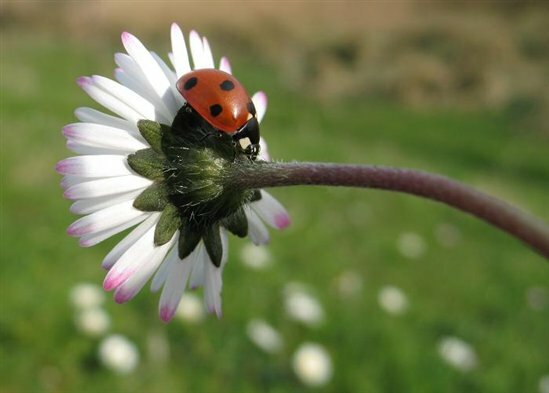 In fact, the 46 species of ladybirds in Britain play an important role in protecting the UK's food supply as they can eat up to 60 aphids a day, which can be a big help to farmers and gardeners. If you'd like to find out more and perhaps get involved in your ladybird research, why not take the Ladybird Challenge?